Lugnut tests out a designer doghouse his owner, John Veale, is selling. Dana Sullivan lives in a South End studio apartment. Chic and cozy — but her roommate is celebrity pooch Sir Harvard Dangerfield, and the guy needs space. The bow-tie-clad Samoyed has a rabid Instagram following of more than 26,000 people. The champion show dog and registered therapy dog frequently makes public appearances throughout Boston. And with fame comes props. Lots of them. Some of Sullivan’s kitchen cabinets overflow with Dangerfield’s accessories: shampoos, lint rollers, treats, T-shirts, hats, and travel bags. There’s also a table topped with animal- and paw-print poop bags, a fishbowl vase brimming with his extensive bow-tie collection (many were gifts), eight more containers of treats, and his daily grooming accessories. In addition to his crate, he has a dog bed, hooks by the door for his leashes (including four Boston-sports-themed ones), and a basket overflowing with toys. “As a poor graduate student, I have occasionally foregone grocery shopping to make sure I could afford food for Harvard,” Sullivan said. The American Pet Products Association has forecast that owners will spend an estimated $62.75 billion on their pets in 2016. That’s up 4.1 percent over last year. “I’m realizing that I actually live in Harvard’s apartment, but I don’t mind,” Sullivan said. 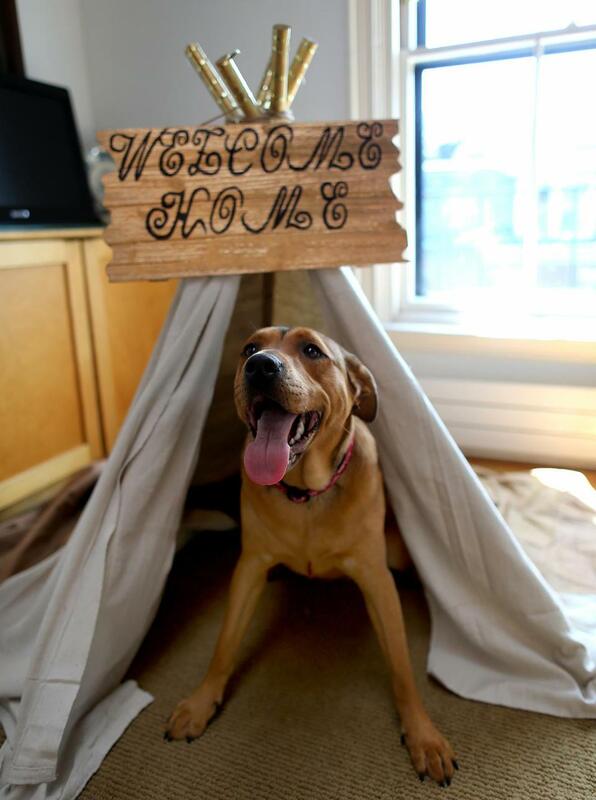 Devoted pet owners go to great lengths to make their furry and finned friends feel like stars at home, even if they’re city dwellers. This is especially true if their humans frequent the Back Bay’s Pawsh Dog Boutique & Salon. Owner Nancy Maida sells pet fountains, custom crates, damask doggie stairs, and elaborately designed food bowls. Her biggest hit? Bowsers-brand animal furniture. Owners arrive with pets in tow and browse fabric books and styles ranging from doughnuts to loungers and mini couches. “People are practical in Boston. They take down all the beds and let their pets try each one,” Maida said. Move over, IKEA; here comes I keeshond. Of course, such accommodations might pale in comparison to dog mansions and “catios” — patios for cats. Lynnfield’s Robin Reed has four cats on several acres, and she didn’t want them to roam free among the coyotes. She installed a 32-by-8-foot walled catio that abuts her tennis court, accessed by a small cat door. It’s adorned with Irish moss, flowering herbs, pansies, and other feline-friendly plantings. Stairs lead to a second-level deck, ideal for sunbathing. “My cats go out there daily. They absolutely love it,” Reed said. Boston Aquariums installed this tank, complete with shark, at a Four Seasons residence. And for those who prefer fin to fur, high-end options abound. 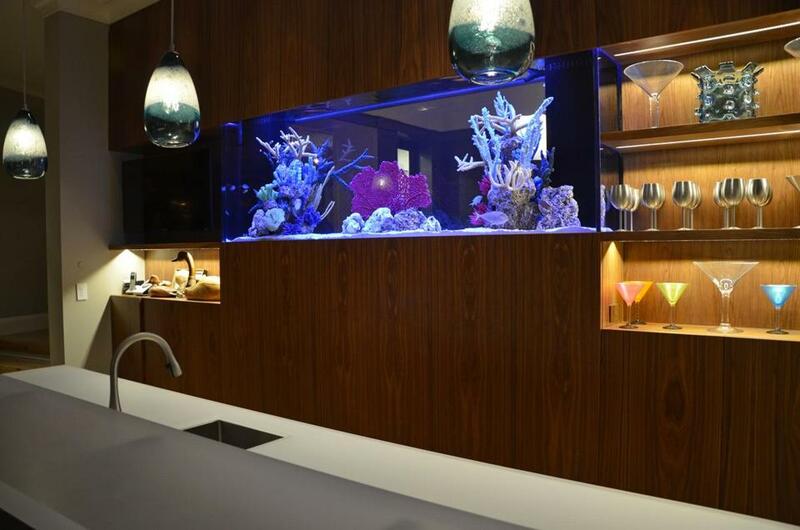 Boston Aquariums in Watertown specializes in regal fish tanks for corporations like TripAdvisor and private clients, such as the owner of a Four Seasons residence who wanted a 350-gallon shark tank. (For some perspective, typical household fish tanks are about 30 gallons.) Boston Aquariums’ tanks are about $25,000 for a 300-gallon to $50,000-plus for a 750, said Keith Borgaro, owner of the company. Another notable installation? 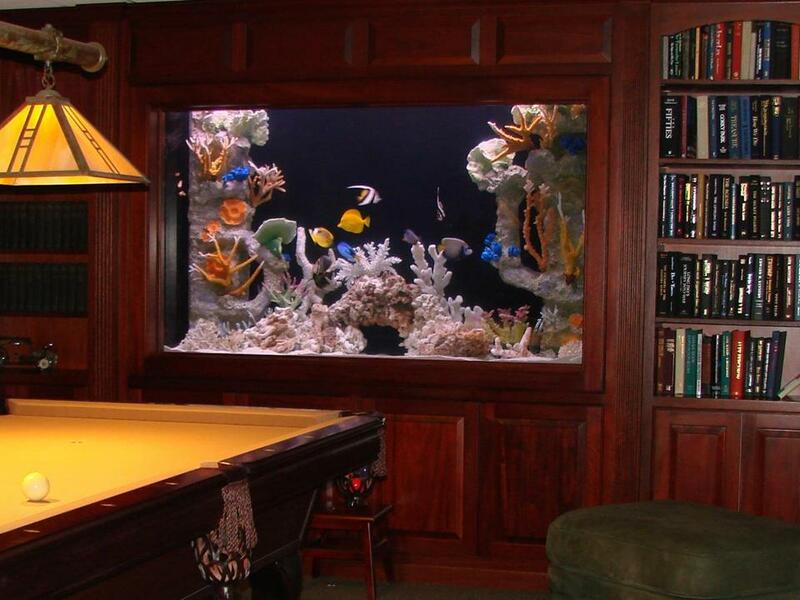 A 400-gallon, 3,000-pound fish tank installed in a Dover billiards room. Slightly more affordable but no less luxurious are designer doghouses. Several varieties have been auctioned off at the annual Weston Pooch Parade and Festival, a fund-raiser for charities like the Animal Rescue League of Boston, Buddy Dog, Operation Delta Dog, and the scholarship fund of the Rotary Club of Weston and Wayland. Last year’s centerpiece was a cedar-shingled, four-columned “pooch palazzo” built by Hall Construction and designed by architect Keith B. Gross. It sold for $3,000. “It’s a canine-sized pavilion that looks like a beautiful little garden structure, designed to age naturally with no maintenance. It really took on a life of its own,” said Gross, who also designed a “Crate for a King” and a cedar-clad Colonial for last month’s festival. 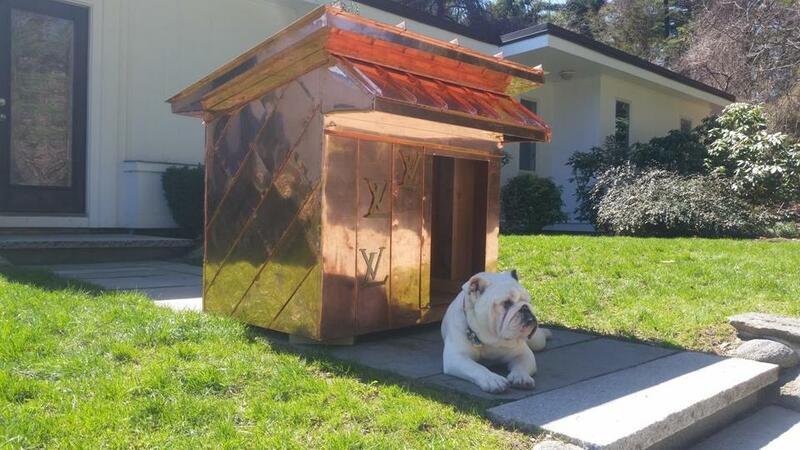 Still on the market: a glamorous copper doghouse designed by restoration and preservation contractor John Veale of Weston for this year’s festival. “I told them, ‘I’ll give you the best doghouse you ever saw,’ ” he said. Veale was true to his word. The roughly 3-by-4-foot, 36-inch-tall copper abode has a tile floor and a mahogany screen door. It’s decorated with brass Louis Vuitton insignias, which Veale replicated by tracing his wife’s handbag designs. Veale used about $1,700 in copper stock for his creation, and parade-goers were wowed by the results. “People were shocked and awed at the design, craftsmanship, and the quality of construction. People said, ‘Oh my God, this is insane!’ It’s sparkly and shiny, and you can’t help but be amazed,” said John Marchiony, a rotarian. The lavish dog domicile is still on offer. Veale hopes to get at least $5,000 and wants the proceeds to benefit an animal charity. In the meantime, his bulldog, Lugnut, takes full advantage. South End celebrity canines Bear, Harper, and Knox were grand marshals at this year’s Pooch Parade. Like fellow urban hound Dangerfield, they have vast social media followings but tight digs. 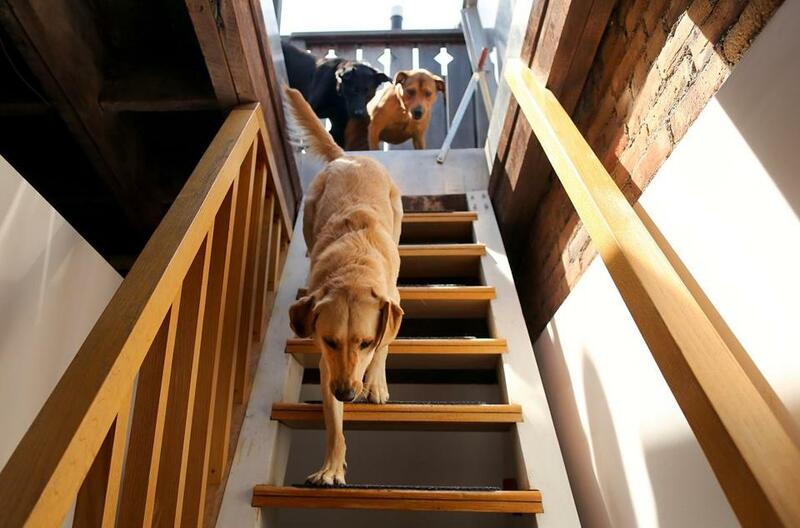 Owner Jenna Donleavy doesn’t have room for a dog mansion — yet — but she keeps the trio comfortable. Her living room is festooned with faux-fur RH dog beds, and there’s a canine lounge chair from HomeGoods on the roof deck. A third-floor office space houses a pet teepee. 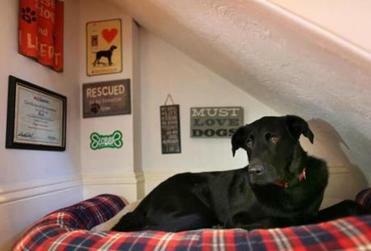 Bear relaxes in his dog nook under the stairs of his owner’s South End apartment. The true showpiece, though, is a dog nook beneath a staircase, inspired by Pinterest. The nook has beds, framed quotes about dogs, and puppy kindergarten diplomas. Call it a man cave for four-legged loungers. “I thought it was a crazy idea, but a bed fits perfectly, and it’s tall enough for them to stand up and turn around. It’s really cozy,” Donleavy said. No puppy diploma to display? No matter. For a wall-worthy showpiece, just call Fred Levy. The Maynard pet photographer (and dog owner) earns $1,000 to $3,000 per project from clients who long to immortalize their beloved cats, dogs, and horses with prints as large as 40 by 60 inches. “My clients . . . love their animals. They want to remember them their whole lives. This is their family. These are their fur babies,” Levy said. Somerville pet portraitist Pawblo Picasso (real name Melissa King) agrees. “I launched my business in 2011, and since then, the response has been overwhelming,” she said. Cats and dogs comprise the bulk of her painting business, though she’s also styled the odd chinchilla or rooster. King sometimes gets commissions from real estate agents, who give her acrylic designs to clients as housewarming gifts. A word about real estate: If you’re looking for a new home in this cutthroat market, it wouldn’t hurt to butter up a pet-loving owner. This worked for Matthew Cox and Jennifer Ponting, whose offer on a Medford Tudor was doubtlessly made more appealing when they made a nonbinding promise to take care of a stray cat, Harriet, and to preserve her cat abode on the home’s back steps. Harriet’s miniature house had roofing that matched the home’s and wallpaper that matched the kitchen’s. “It was striped and kind of garden-themed,” Cox said. The cat’s house also has a heated mat and water bowl. Cox’s realtor confirmed that the couple would indeed look after Harriet, conveyed the promise to the nervous homeowner, and the deal was done, wallpaper and all. “The owner was very worried about moving. She clearly had an affinity for cats,” Cox said. Four years later, the wallpapered cat hut is in mint condition. The couple redid their kitchen walls, though. 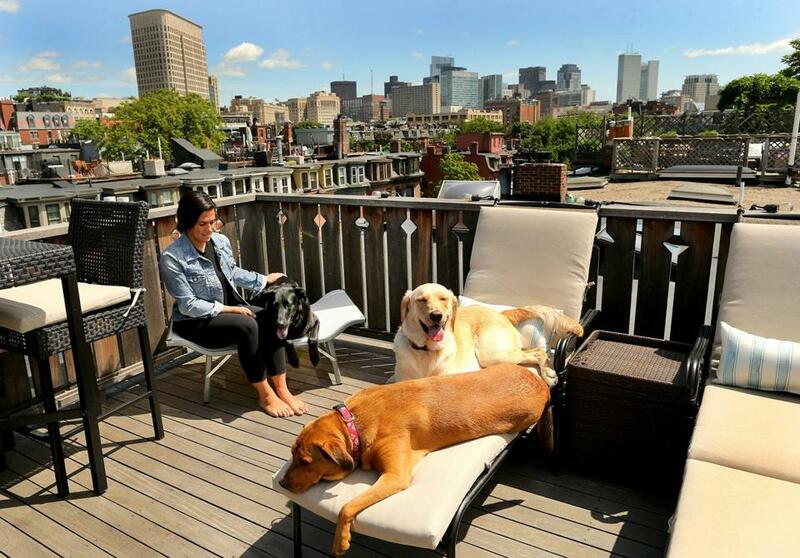 Jenna Donleavy relaxes with her dogs — Bear (next to her), Harper (out in front), and Knox (in the back) on the rooftop deck of her South End apartment. Harper climbs into his dog teepee. 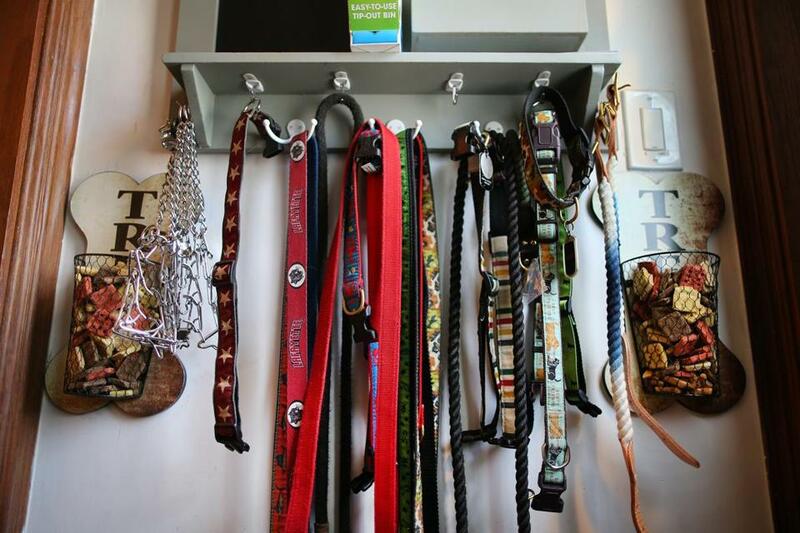 Their collection of collars, leashes, and treats is well organized. 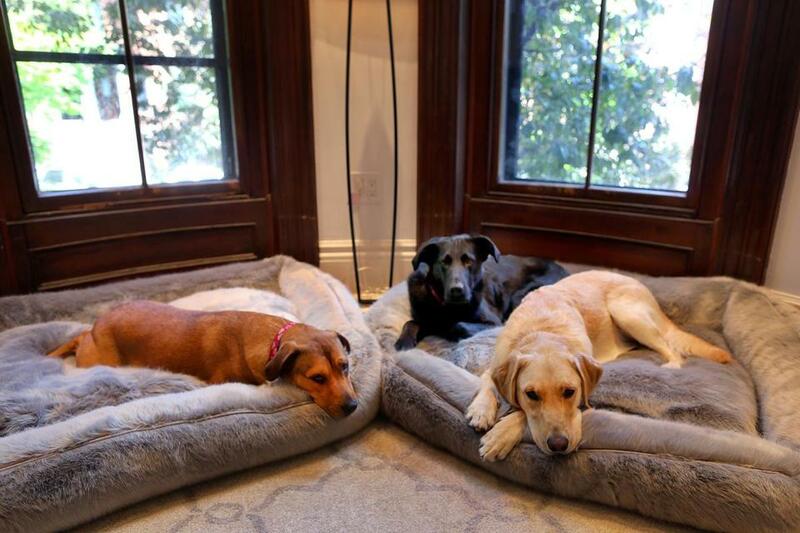 From left to right, Harper, Bear, and Knox relax on their plush beds. A tank adds visual interest to an elegant billiards room in Weston. A fish tank brightens up a stylish bar.